A few months back I finished the 4th Thursday Next novel Something Rotten by Jasper Fforde, which finished off the first story arc. Instead of doing a review for book 4 in a series I haven't reviewed on this site before and one that has been out for a few years I thought I'd show some love for the series on a whole and in turn hopefully entice people to try it out. I admittedly got on the Jasper Fforde bandwagon very late since his first book The Eyre Affair came out a little more than 7 years ago. I was introduced to the series by a good friend about 2.5 years ago who told me I would devour them and that they only get better. How right he was. However, the first book in the series The Eyre Affair ended up sitting on my shelf for 6 months until I finally cracked. I'm not much of a Jane Eyre fan so I was a bit thrown off by the title and the fact that the books are pushed to the literary crowd rather than the fantasy. The series now stands as one of my favorites and the font of ideas that Fforde manages to fill a chapter with is often more imaginative than most authors devout in half of their books. Fforde has accomplish an amazing feat by seamlessly combining a work full of literary references, good and bad puns, Sci-Fi, Mystery, Thriller, Paranormal, and Fantasy elements and yet they all meld into something very comprehensible and an absolute joy to read. The series arc is also clearly well planned as seemingly insignificant things are mention in early books only to be pivotal later on. I can also attest that the series only gets better as Fforde lets loose his imagination. Fforde is kind of like a classy version of Christopher Moore. So if you like your books with a touch of humor look no further than Thursday Next, which oozes funny goodness with heart and lots of action. Read on to learn more about this series. Thursday Next is a female Literary Detective or LitTech in Britain on an alternative earth with a slightly different history than our own. Britain is still fighting the Crimean War with Russia. Thursday's father Colonel Next has been eradicated by the Chronoguard (Time Police) yet she and her brother still live even though no one else can remember him except her mother, which never makes sense fully but if you go mucking about with time you get what you deserve. A similar action befalls someone else Thursday loves in later books, which leads to a long storyline. In Thursday's world literature is considered of the highest order and protected vehemently. Neanderthals have been brought back by science as well as dodos that are no longer extinct and are common pets, which includes Thursday's lovable Pickwick. Thursday's Uncle Mycroft is a genius inventor. His invention is the Prose Portal which allows people to enter books. There is an evil Corporation fronted by a character aptly named Jack Schitt as well as a super villain of sorts which Thursday must capture or he will use the Prose Portal to change the ending of a literary classic, which cannot be allowed. Thursday also lends a hand to a Werewolf hunter for extra cash, who seems to pop-up in every book. All in all this is a splendid introduction to Thursday and even through all the oddness connects you to Thursday as a strong and smart character. The world building is immense for such a short book and you get many inklings of things to come. The Goliath Corp is upset with Thursday. She finds out that their is a police force of sorts that look after books called Jurisfiction who live in Bookworld made up of characters from books and a few humans. Thursday is under investigation for possibly changing something while in a book. This opens the Thursday Next series wide as characters from books come to life and it also goes into the psychology of book characters as they are forced to replay the same roles over and over and what they are doing when no one is reading them. We also learn about creatures that ruin books like locusts call grammarsites and a few other related creatures. The best part though is visiting the Great Library where all books ever written are housed. This is truly a book lovers dream come true. Catching the literary references will be half the fun as many of things brought up are not strictly literary as Fforde brings in other genres such as creating his own Darth Vader-like character. This is the book that made the Thursday next series one of my favorite as Fforde keeps surprising me with his wit and charm. The Well of Lost Plots explores Bookworld indepthly and many literary works as you visit their pages. Thursday is living in The Well of Lost Plot which is a subsection of the Great Library for works-in-progress or works that will probably never be published. A book character has escaped into the real world, which really mustn't happen. Thursday has to go toe-to-toe with many fictional and mythical characters and creatures. There is a lot of intrigue in this volume as there may be a rogue member of Jurisfiction. Fforde also introduces the footnoterphone, which could have been annoying in other hands. All I can say is it was quite a ride and Neanderthals rules. Now go out and read The Eyre Affair to start you on becoming a lifelong fan. Fforde is every bit as wonderful as Douglas Adams was in his glory and as great a storyteller as, dare I say it, Neil Gaiman. Whoops! I almost forgot to mention the importance of toast. Well, it is important and don't forget it lest the Toast Marketing Board come after you for defamation. Fforde has a second series starring Thursday and a relative of hers, which is already begun with the aptly named Thursday Next: First Among Sequels. And than there is the spin-off series of sorts called Nursery Crimes starting with The Big Over Easy followed by The Fourth Bear with at least one more title planned. The Nursery Crimes series takes place in one of Thursday regular haunts, but from what I know you needn't have read the Thursday books at all to enjoy them. Also, the first Nursery Crime book was originally written prior to the first Thursday book but later adapted to fit in. Oh, and Fforde has an entirely new series starting this year with Shades of Grey, which stands apart from the Thursday Next universe. 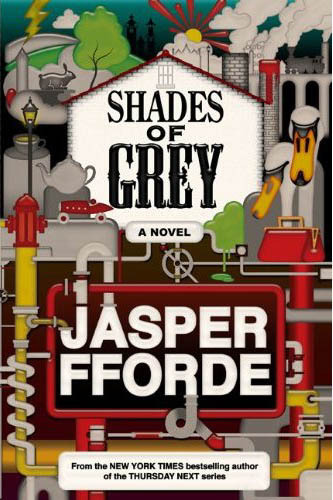 Lastly, check out Jasper Fforde's site which has loads of info. I'm a big fan Jasper Fforde as well. The Thursday Next series is awesome and I the two nursery crime books are excellent as well.